When designing your home solar power system, always begin by doing an energy audit and find out how much electricity your home is consuming. Next, decide how many electrical appliances you want to connect to the solar power system. 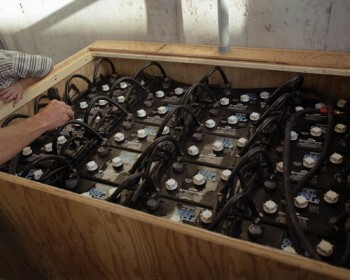 That figure will help you to decide how many deep cycle battery you will need for the battery bank. You can check the acid in the battery by using a hydrometer. A hydrometer is what you use to measure the actual specific gravity of the acid inside. On the hydrometer, you can see several discs floating. For example, if you see 3 discs floating with one at the bottom, you’ll know the battery is about 75% charged. Here’s another safety tip. The gasses that come off from the battery, hydrogen gas (H2), can be hazardous as well. It is highly flammable. Make sure you work with the batteries in an open space and no sparks or open flame nearby. Are you planning to build your own home solar power system? If you are, check out Michael Harvey’s Earth 4 Energy guide. Michael’s e-book comes with step by step instructions on how to make a DIY solar panel with minimal cost. Check out my review of Earth4Energy on this blog for more information. I would be paying $3960 a year. So for the first 3 months, I would be paying off the solar panels and Inverter I will be purchasing. That’s a no brainer to me, should have look into this along time ago. I think once solar products for the home become more aesthetically attractive the investment will be more sustainable. right now it requires a real DIY spirit that avg homeowner either doesn’t have or can’t find the time to invest.